Horncastle & Sons Roofing Ltd is a Family run roofing company based in London. We have been working within the roofing industry for over 30 years and have a vast knowledge and experience in all aspects of residential roofing. Our family business specialises in all types of domestic roofing and scaffolding. We specialise in slating, tiling, flat roofs, zinc work, lead work, guttering, skylights, carpentry work, coping stones, insulation and many, many more. We have our own scaffolding division, which means that work can be executed more speedily, we can also control when the scaffolding is erected and dismantled. All of our work force at Horncastle & Sons are qualified, skilled and experienced. We, train and teach our teams to the highest levels so that we can offer the best possible service to you, our client. Our young apprentices are sent on various skilled courses to obtain the relevant qualifications. 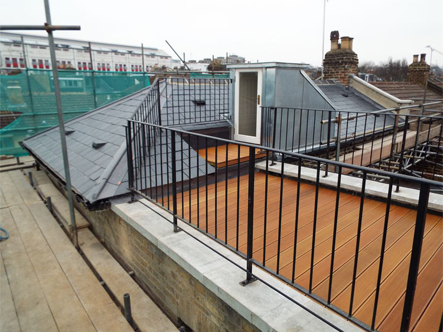 Horncastle & Sons have earned the reputation of one of the most reliable roofing contractors in London. Our family-run business is built on hard work and due diligence of its work force. Our helping attitude and professionalism is what sets us apart from the rest. We believe that your roof is an important asset to your property because it is the only protection that covers you and your belongings from the weather elements. We only use the very best and highest quality materials for all our works. We are accredited members of the Competent roofer scheme, National Federation of Roofing Contractors, Trustmark and Fair Trades. More information can be found on our accreditations page. If you would like to discuss a roof repair, new roof or any future project please feel free to contact us. Slate is as old as the planet we live on and it has been quarried and split to provide roof coverings for hundreds of years. We provide all affordable tiling solutions from clay to concrete. High performance torch-on flat roofs insured with a manufactures backed guarantee. Milled lead fitted to the legistlations as set out by the LSA. We have vast knowledge experience of traditional victorian Zinc roofing, dormers, flat roofs, valley gutters, cheek sides and bay tops. We cover all aspects of roofing repairs, from a single tile replacement to complete roof overhauls.